The Pacific Northwest has its own version of the seven summits: Hood, Adams, St. Helens, Rainier, Glacier, Shuksan, and Baker, stunning peaks that crown the Cascade range. 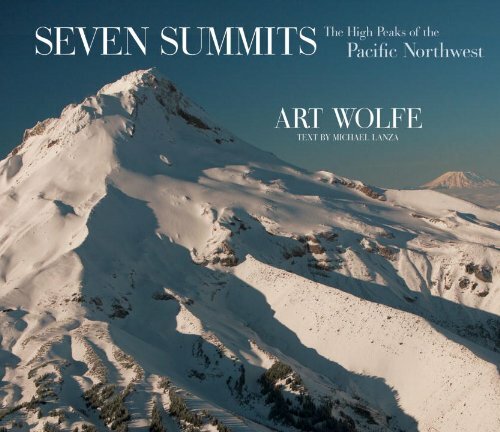 Art Wolfe captures their untamed beauty from near and far in breathtaking images that reveal high snowfields, lush old-growth forests, and the haunting blue light of glaciers. These striking photographs convey the many moods of these untamed mountains, which for many people represent the last pure and wild places on the planet. Michael Lanza's text includes fascinating little-known facts about each of the seven summits. Internationally acclaimed landscape and wildlife photographer Art Wolfe has published more than 45 books. He lives in Seattle. Northwest editor of Backpacker magazine, Michael Lanza lives in Boise, ID.